Today we published the key performance indicator (KPI) data for the second quarter of 2016 to 2017 (Q2, July to September 2016). The KPIs are used to measure how the NHS screening programmes are performing and aim to give a high level overview of programme quality. 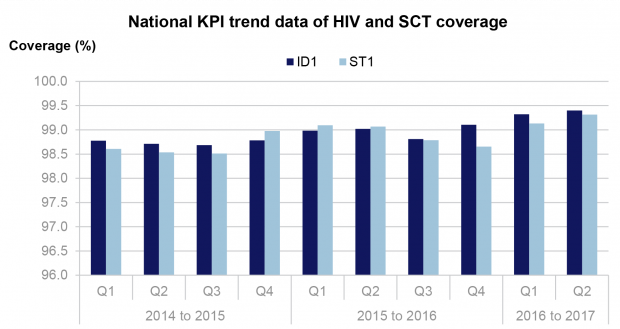 National performance of ID1 (HIV coverage) and ST1 (sickle cell and thalassemia coverage) have again increased slightly, with new record highs of 99.4% and 99.3% respectively (see the graph below for national trend data). Another record high performance was seen in diabetic eye screening for DE2 (results issued within 3 weeks of screening), with the national performance at 98.3%. We have now started collecting the data for FA2, the fetal anomaly KPI for coverage of the 18+0 to 20+6 week ultrasound scan. FA2 is reported 2 quarters in arrears, so we have only just collected Q1 2016 to 2017. As a new KPI in its first year of collection, FA2 will be used only by the national programme, regional screening quality assurance services and healthcare professionals. We will work to improve the data quality and completeness during this first year before aiming to publish the data from Q1 2017 to 2018 onwards. As we mentioned in a blog last year, we have been working on a faster publication process for the KPIs. This is working well and we are pleased to announce the following specific dates for the publication of the KPIs for the rest of 2016 to 2017. The Q3 (October to December 2016) submission window is March and the data will be published on Wednesday 17 May. The Q4 (January to March 2017) submission window is June and the data will published on Wednesday 16 August. The publication dates for the KPIs throughout 2017 to 2018 will be in the next edition of our KPI definitions document. The submission window for Q3 (October to December) KPI data is open from 1 to 31 March. Please email your completed template to phe.screeningdata@nhs.net within this time.